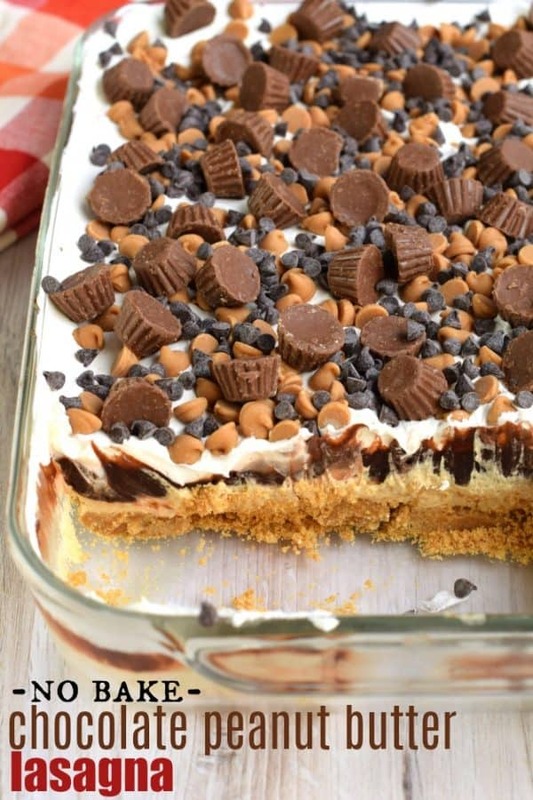 The combination of chocolate and peanut butter is always a win. When you add in cookies, fudgy chocolate pudding, and whipped cream, you’ve got a home run dessert! 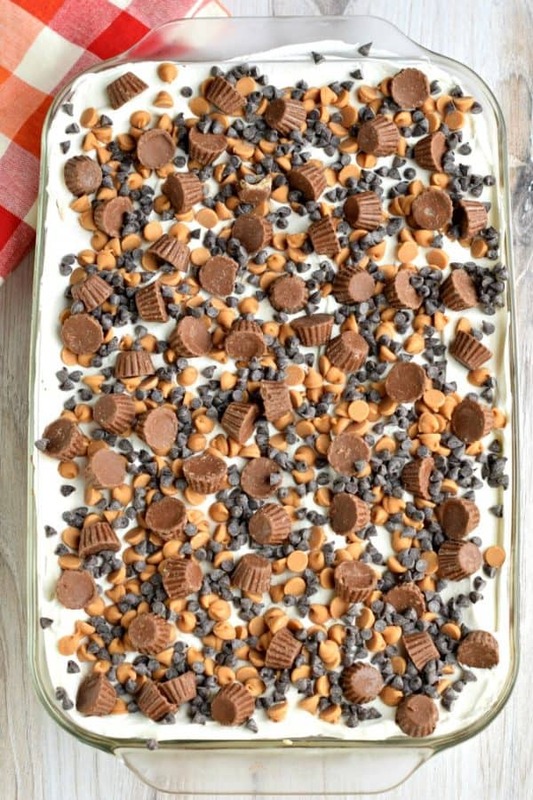 Oh and did I mention this is a No Bake dessert? Perfect for any time of year! Slap a lid on this treat and take it to your favorite pot luck or family party. It’s loved by kids AND adults! 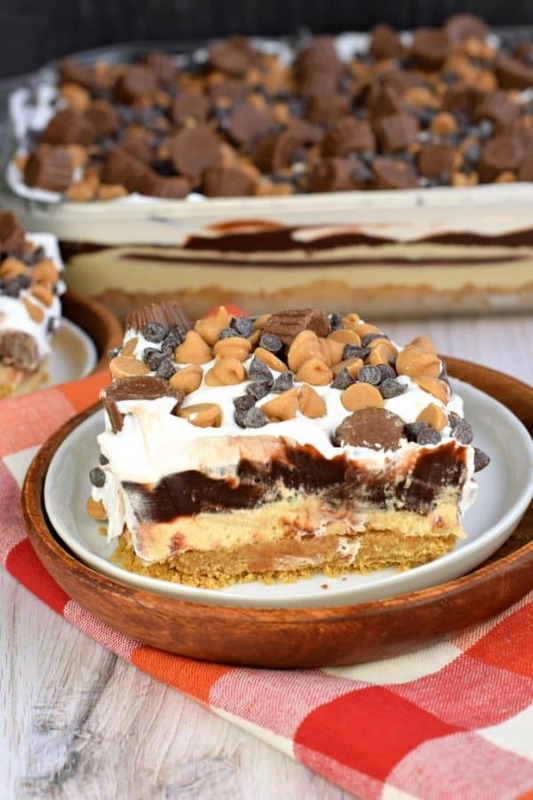 You may remember this Chocolate Chip Cookie Lasagna recipe from awhile back. 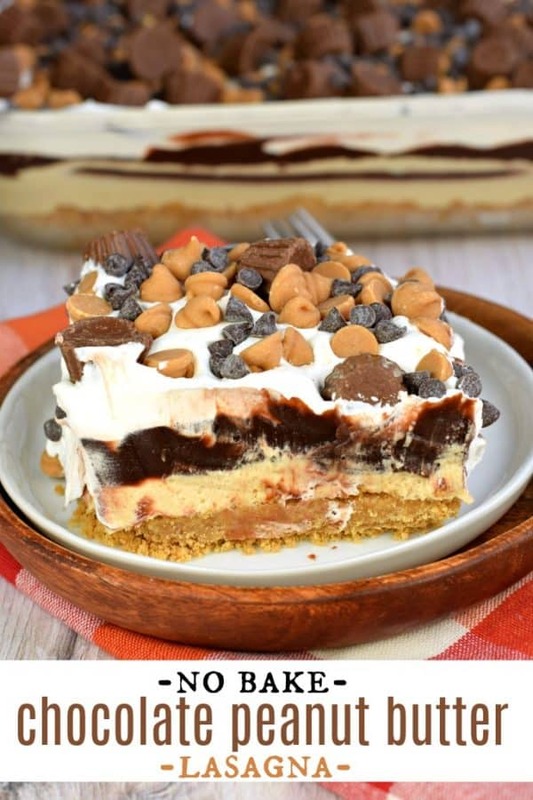 No bake dessert with layers of chocolate chip cookies, creamy cheesecake, fudge pudding, and whipped cream! Today’s recipe is a variation of that sweet treat! Start by choosing your favorite cookie for the crust. I chose Nutter Butters for their peanut butter flavor, but Oreo cookies are also a great choice! Crush cookies in a food processor to get a fine crumb, then add melted butter. Press the cookies into a 9×13-inch baking dish. Set aside. For the peanut butter layer, beat the softened cream cheese with peanut butter and powdered sugar for several minutes, scraping down the sides of the bowl as needed. Once fluffy, fold in Cool Whip. Spread over cookie layer using an offset spatula. Set aside. Use INSTANT pudding mix, not the cook and serve variety. Once your pudding mix is fully whisked, pour over peanut butter layer. Top the pudding with Cool Whip. I also added some peanut butter chips, mini chocolate chips, and mini peanut butter cups. Refrigerate for about 3 hours until set (or overnight). Slice and enjoy! 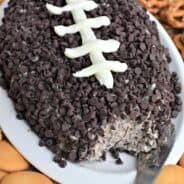 Everyone loves easy, no bake desserts. 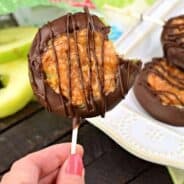 Here are some of my favorite chocolate peanut butter NO bake treats! Peanut Butter Rice Krispie Treats topped with melted Reese’s PB morsels and mini Reese’s PB cups. 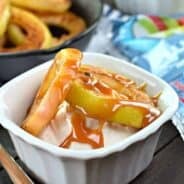 A delicious twist on a childhood favorite! 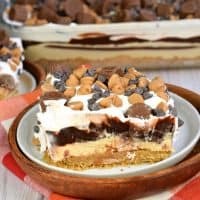 Chocolate Peanut Butter Lasagna is a no bake, light yet decadent dessert! Packed with flavor, you'll watch this disappear in no time! In a large bowl, beat softened cream cheese, peanut butter, and powdered sugar until smooth and creamy. Fold Cool Whip in cream cheese mixture until blended. Add remaining Cool Whip to the top of the peanut butter lasagna. Sprinkle with more mini chocolate chips, peanut butter chips, and mini peanut butter cups. Refrigerate for 3 hours or overnight. I loved this! Such an amazing dessert!! 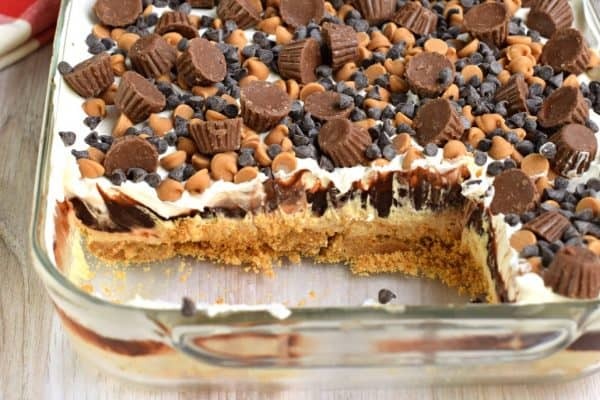 This is one of my favorite desserts with chocolate and peanut butter! So good!! I am IN LOVE with this dessert. It’s so easy and the flavors are perfect! I’m a little confused about the cool whip. You call for 1 8 oz tub but I can’t seem to find the division of it. I am assuming half and half but I would hat to ruin this yummy looking dessert!! Aloha from Waimanalo Hawai’i! !